This week the U.S. Marshals are on the hunt for an aspiring rapper named 'BabyTeeth' who is accused of beating his girlfriend with a hammer. DETROIT (WXYZ) — This week the U.S. Marshals are on the hunt for an aspiring rapper named 'BabyTeeth' who is accused of beating his girlfriend with a hammer. 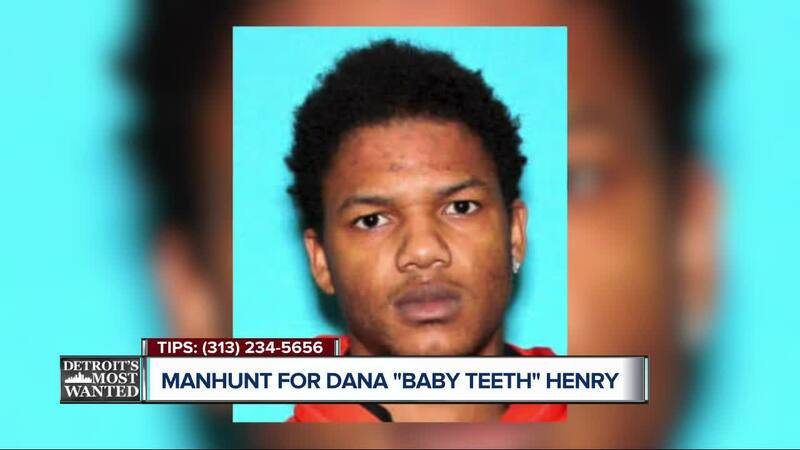 Police say all you have to do is search 'BabyTeeth' and you'll find 27-year-old Dana Henry's music. Henry's crimes -- gang activity and domestic abuse -- span across metro Detroit, and police believe he could be anywhere. "When we found out about his aspiring rap career, we were kind of shocked at his name 'BabyTeeth.' You have a guy that likes to beat women, he’s a drug dealer and he kind of picks the name baby teeth," said U.S. Marshals Deputy Rob Watson. Deputies say Henry's crimes are anything but small. He allegedly attacked his girlfriend at her home on Detroit's east side. "Not only did he beat this woman, he picked up the hammer and hit her in the head with it," said Watson. "And to make matters worse, then he picks up a gun and puts it to her face with these two kids there to see it and threatens to kill their mother." The suspect is also reportedly a member of the 11 deep gang located in Detroit. "The gang is called 11 deep, but once we arrest this guy, they’re gonna have to change their name to 10 deep," Watson said. Police say Henry is still freely using social media to promote his rap career. He has criminal history in Taylor, River Rouge, Detroit and Dearborn, and officers believe he could be in any metro Detroit community. He is 6-feet 2-inches, about 150 pounds and has a tattoo on his neck. U.S. Marshals are counting on your help to put BabyTeeth behind bars. "This is one of the big reasons we do Detroit’s Most Wanted -- to get communities out there and involved, to get them engaged, so they can have a stand, so they can work with law enforcement to let us know where these problems are and get these people off the street," said Watson. As always, there's a cash reward for any information leading to Dana Henry's arrest. You can call the U.S. Marshals anytime at (313) 234-5656.